One of the very first authentic arcade sticks to reach North America from Japan. The guts are made from arcade parts, and the stick has a very enduring fanbase, especially in Japan. It's very moddable, with lots of space inside, and if you've got a pile of adaptors you can use it on almost every console. While the buttons are custom on top, they use the same keyboard-like switch used in most Sanwa/Seimitsu arcade buttons, mounted to a PCB like almost every stick made since. The stick mechanism varies between regions and revisions. The US and the newer Japanese version had an unbranded stick mechanism, similar to a non-PCB Seimitsu LS-40, however, the early Japanese models shipped with a Sanwa JLW stick assembly. This stick has a wealth of features. There's an independent turbo-fire for each button, and each button has an LED that blinks to indicate the turbo speed. It has a 4/8-way select switch, a very rare feature, that prevents diagonal movements. This makes it ideal for emulation, or playing games where diagonals are undesirable (like PacMan, which freaks out if a diagonal is pressed). The design is a radical departure from the standard joystick profile. Despite the age of the components the stick is a real solid beast, and will put up with a shocking amount of abuse. Originally launched for the Super Famicom and Famicom (It included two cables for both platforms) this stick is also perfectly suited for Capcom's CPS Changer. There was an infra-red remote attachment for the SuperFamicom (which will work with the CPS Changer) that clipped onto the back of the stick where the console cable would normally go. This attachment was never released in North America, and outside Japan the stick still had a (completely disconnected) battery compartment. There was an adaptor released for the X68000, included with every copy of Street Fighter 2', which allowed the use of this stick, as well as any other MegaDrive/Genesis six-button pad. It also allowed the stick to work with the FM-Towns + Marty systems. 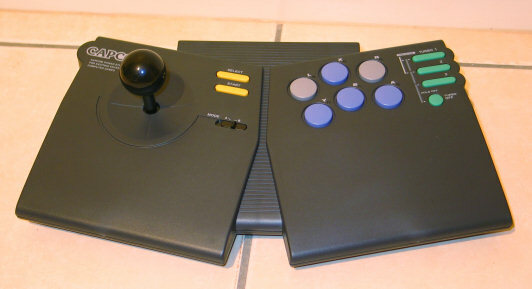 This stick is also available in white, as a MegaDrive version. There are two connectors on the rear, one is used for the infra-red remote pack, the other is a heavily modified DB-15 (NeoGeo stick connector) plug. This pinout is totally different from the Capcom Fighting Pad, that queerly shaped thing released for Megadrive, SNES and 3DO. If memory serves it's the same as the ASCII sticks from back in the day.